Swordfish is one of the meatiest fish you will find; the flesh is cut into "steaks," making it ideal for grilling and skewering, as well as other cooking methods that don't fare well with more delicate fish varieties. The mildly sweet flavor is perfect for the addition of marinades and sauces, and the cooked fish results in a moist, somewhat meat-like texture (as long as the swordfish steaks are not overcooked). Swordfish is a sustainable seafood choice but does have an elevated level of methyl-mercury, which, the FDA advises, can be dangerous to young children, pregnant and nursing women, and women of child-bearing age. Therefore, these groups should avoid eating swordfish. 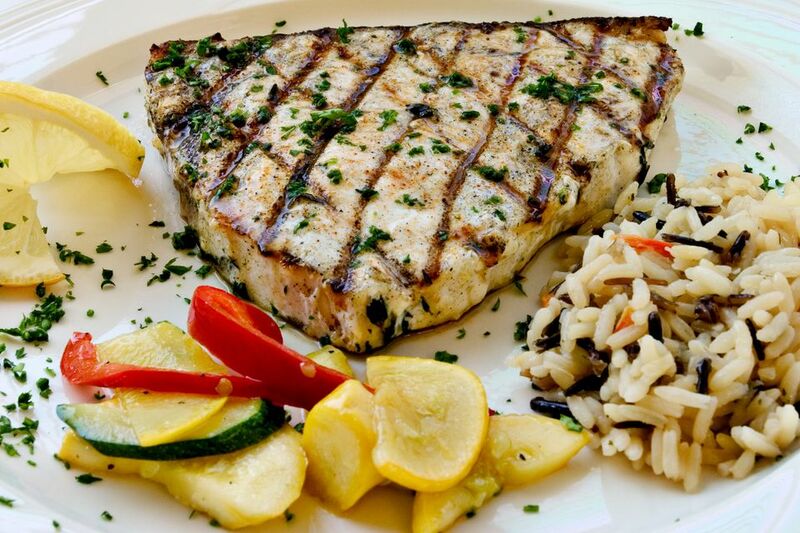 Swordfish is always sold as steaks, and the meat is so firm that many non-fish eaters will gladly eat it. This texture also makes swordfish excellent for grilling and helps prevent the steaks from falling apart on the grates. A good swordfish steak doesn't need much more than a simple olive oil-based marinade, time on the grill, and some lemon, salt, and herbs when serving. This fish is also a good base for an Asian marinade or fruit salsa. Basically, you can dress up swordfish with a variety of flavors as long as they don't overpower the fish. Use high heat to sear the outside, and let it stay a little rare in the middle, about 5 minutes on one side, then 2 to 3 minutes on the other for an inch-thick steak. The uneven time gives you a great sear on one side (the side you serve facing up) while not overcooking the swordfish. You can remove the skin (on the edge of the steak) before or after cooking, but if you leave the skin on while you grill, it helps keep the meat moist. Take it off before serving, since the skin is rubbery. Swordfish is also a fantastic stewing fish because it remains firm and intact in the broth and won't dissolve. Use it as a component in something like Cioppino or another fish stew, or slowly simmer it in tomato sauce. Swordfish is also delicious in a fish chowder. When a recipe calls for tuna, replace with swordfish. Poach it slowly in olive oil, then flake it into a salad. It is deeply meaty this way and will kick up a salad Nicoise or even a classic tuna salad. Swordfish is generally not a great candidate for poaching or deep frying, although a quick saute or sear in a hot pan works well. When choosing swordfish, look for the little strip of dark meat to be red, not brown. If it's brown, the meat is old. Know that East Coast swordfish steaks tend to be a little rosier than Pacific sword; it's due to their diet, which is mainly other fish plus a little squid. Tightly wrapped swordfish freezes well for about 3 to 4 months, but beyond that, it goes downhill fast.